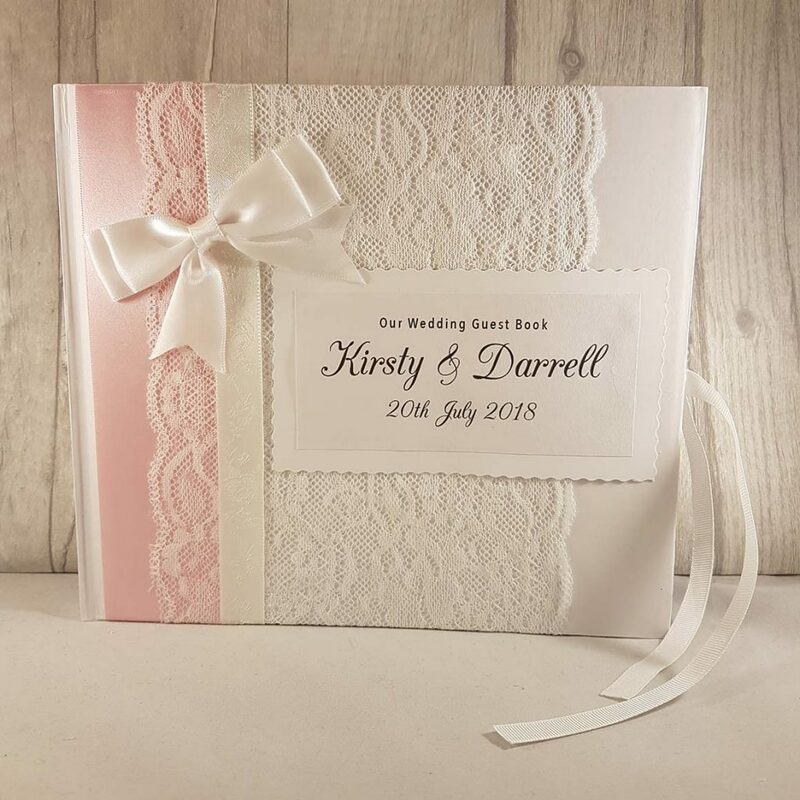 This beautiful and classy guestbook is perfect for weddings, birthdays and parties. 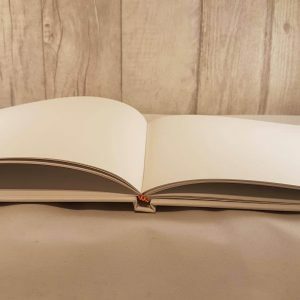 It has 22 pages of thick white double sided paper, perfect for your guests to write their memories on. If you want a personalised guest book handmade to order, this beautiful and sturdy guest book is ideal. 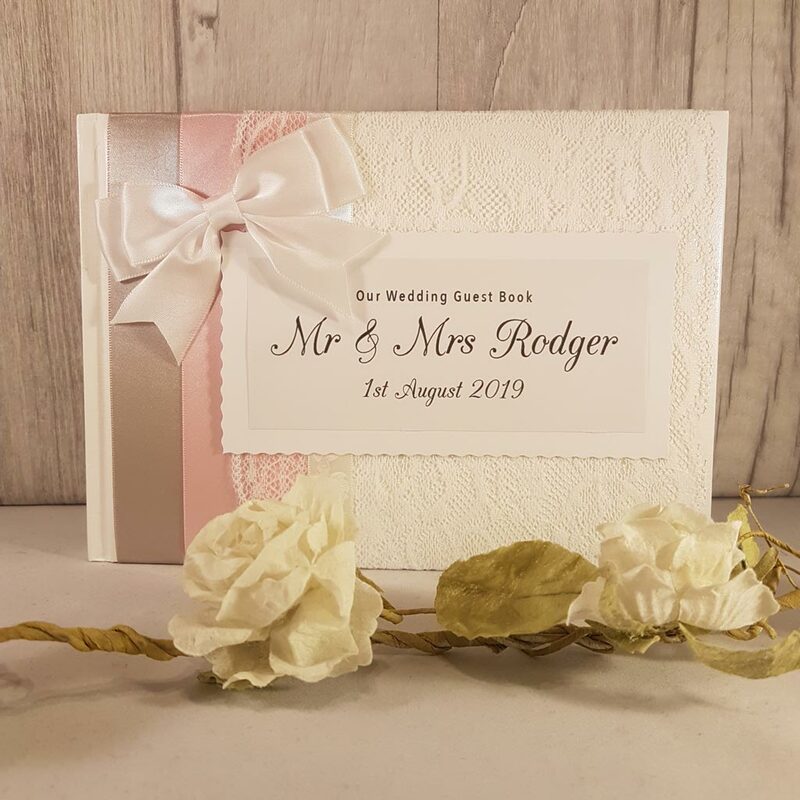 Covered in shimmery lace and stunning ribbon, the guest book has a padded front and comes in a box so you can keep it safe for years to come. I make your guest book when I receive your order. Nothing is pre-made – this is how I make it 100% bespoke to you. I can discuss extra details with you too (I’ve added Minnie Mouse pictures before) to make it exactly how you imagined. The materials I use (ribbon, lace, even the glue) are from UK suppliers. I only use top quality materials I would be happy to receive as a customer myself. This guestbook is very popular for weddings. Customers have used this for Baby Christenings, Baby Birthdays, 50th/60th Birthday Parties and Engagement Parties. I can customise the text to however you wish. 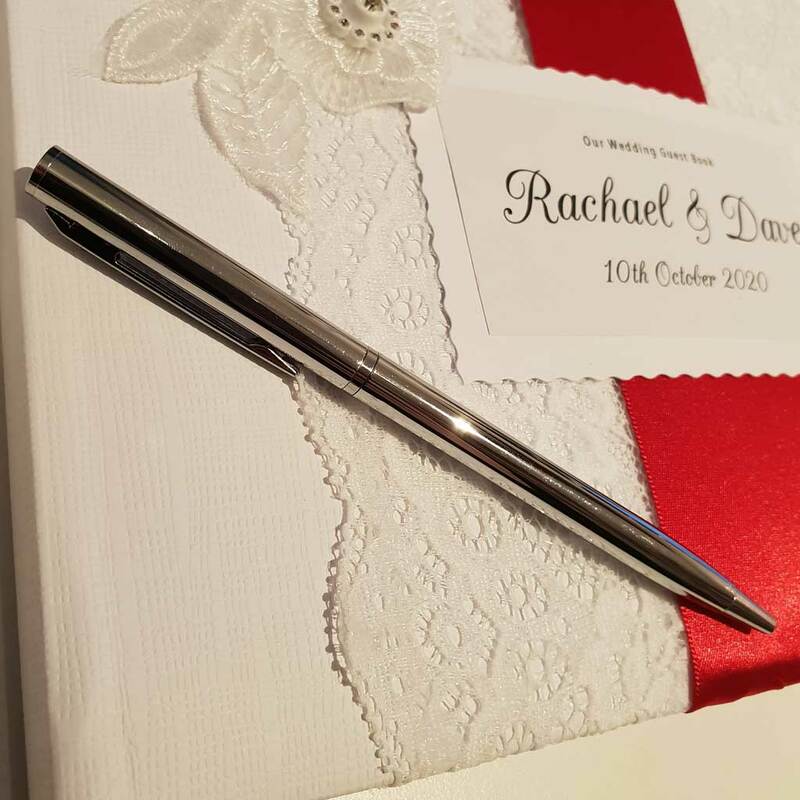 How can I personalise my guest book? You can have ANY text you like for the front. Please add the details in the space provided above, or email me. Different Font? If you would like me to use a different font, that’s no problem! Let me know which font on the checkout page in the ‘Notes’ section. Or send me an email after purchase. 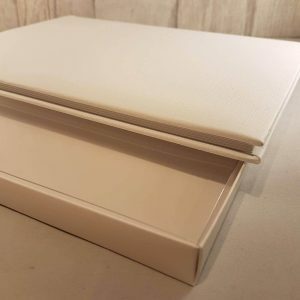 Larger Guest Book: If the A5 size is too small, you can choose in the options above, the Larger Guest Book, which is 20cm x 22cm, and has 34 double-sided white pages. The larger version has 2 lovely white ribbons to tie the guest book closed. 2nd Ribbon Colour: If you have 2 colours in your theme, I can add a 2nd ribbon to your guest book. Please see my Double Ribbon Guest Book. Buy this Personalised Guest Book with a matching Personalised Post Box to get 10% off the lot! Use code together at the checkout. 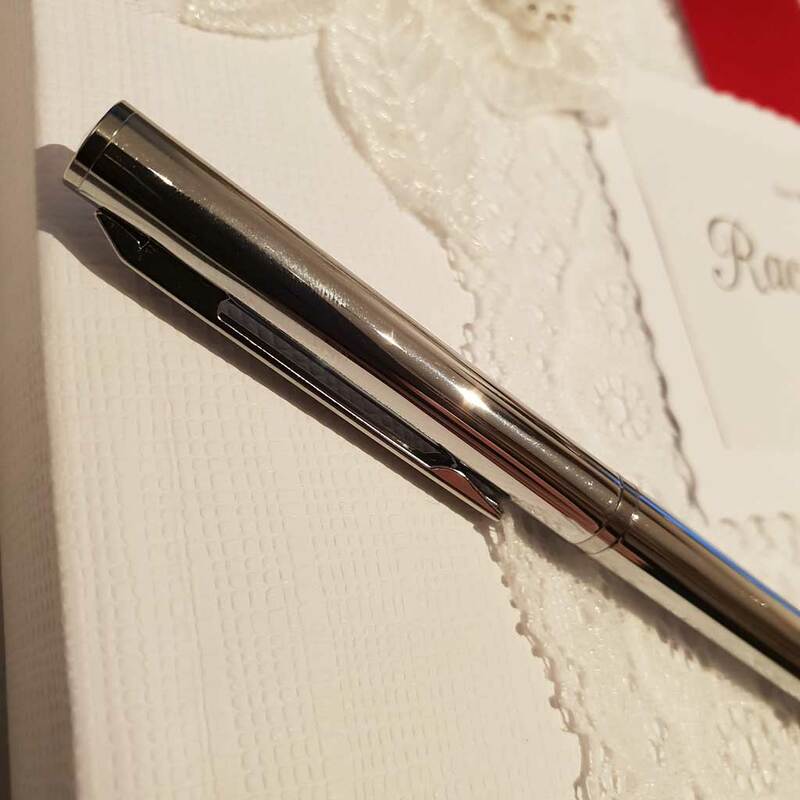 You’ll need a pen for your guests to use to write their memories with. This pen has black ink, and is silver in design. 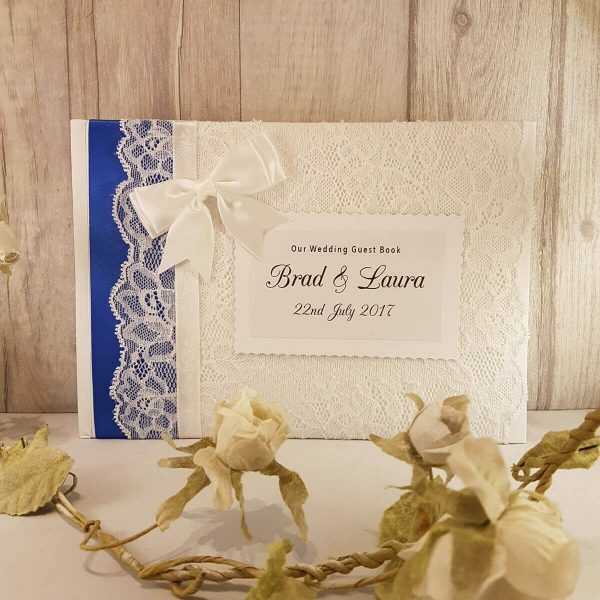 If you’d like to add photos to your personalised guestbook, you can buy sticky corners which gets you a pack of 100. 4 are needed for each photo which you use at each corner, to stick the photo to the page. These are DIY sticky corners so you can add photos yourself. 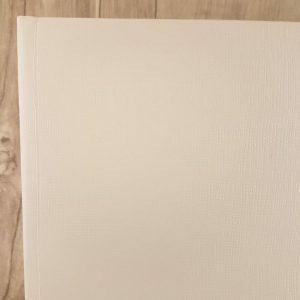 This is such a good way of incorporating photos as and where you want them in your guestbook (say you have a blank page left in your guestbook after your event). If your theme has 2 colours, I can add 2 ribbon colours to your guestbook – overlapping, with one on top of the other. If you would like 2 ribbon colours, I can do that for you! Please see my Double Ribbon Guest Book. The larger guestbook measures 20cm X 22cm, and has 34 double-sided pages (not 56 as per the A5 version). 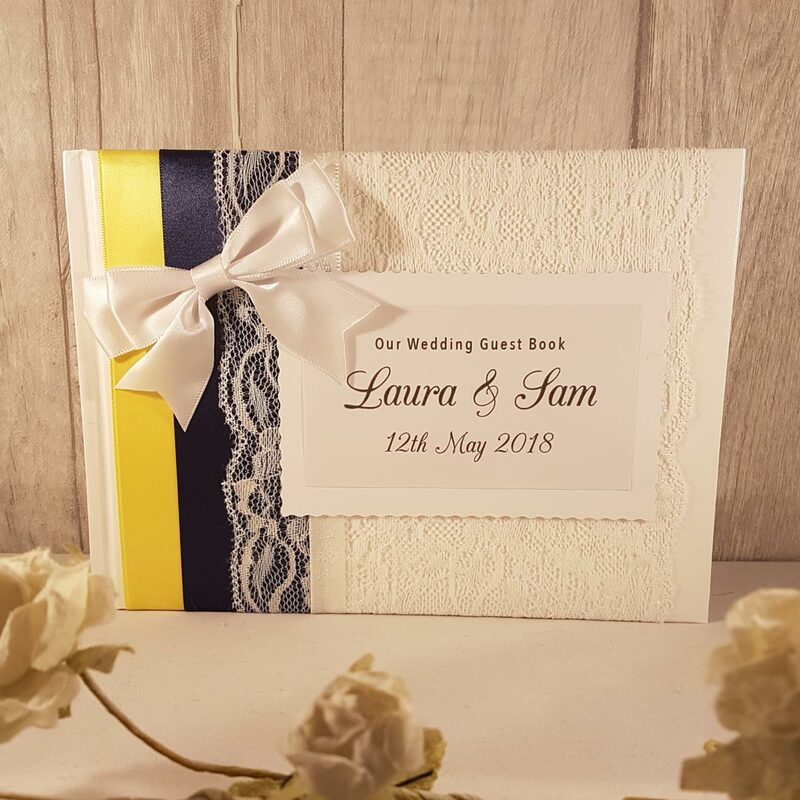 This larger guestbook has a lovely feature of 2 white ribbons to tie it closed. I cut ribbon and lace, make name badges and get my glue gun at the ready each and every time I receive an order. I’m pleased to say postage is FREE! Your guestbook will be posted Second Class via Royal Mail. You may choose First Class if you need your order sooner, which you can select and pay for (a small charge) on the Checkout page. I will make your guestbook within 3 working days of receiving your order. If you need it sooner, I can usually do this but contact me before you purchase, just to make sure. I’m pleased to say I’ve never had a customer return one of my guestbooks. That being said, if you aren’t happy with your guestbook, please get in touch with me so I can sort this for you. The guestbook must be in the absolute same condition it was sent. This means it needs to be unmarked, unused and in its original packaging including box. Any extras must be returned too (pens, sticky corners, etc). I will issue a refund the moment I receive it. Each sample is approx 2 inches, helping you understand if it matches your theme. I understand how important it is on your big day to make sure all colours match – that’s why I’m offering ribbon samples to be ordered in my online shop! Great – Thank you so much love it !! I ordered a wedding guest book from Ahoy Designs after seeing the beautiful pictures and reading about the great reviews they received. My guest book arrived yesterday and I can honestly say I am really impressed. It is so pretty. I’m looking forward to using it very soon. Aside from the guest book itself, the service I received from Ahoy Designs was excellent. Great communication, very friendly and very accommodating…I had made a mistake in my order which was able to be changed with no problems whatsoever. Overall, I highly recommend Ahoy Designs!!! Perfect and an amazing seller! Thankyou! Ordered a guest book for our wedding. I love it! It’s beautifully made and was really quick to arrive. I also received messages up dating me on the process and expected delivery date. Can’t wait to use it! Thank you Rachel for the nice guest book .It’s really nice .i love it!!! Amazing quick service. Thank you. Highly recommend we absolutely love our guestbook and we received so quickly ! I’ve just received my guestbook and it is perfect! I couldn’t be happier with my purchase. Thank you very much! Fast efficient service. Definitely recommend. Thank you! Rachael was so helpful, I love the wedding guest book. Highly recommended!! Arrived very quick A** fantastic quality! It’s perfect thankyou! Absolutely beautiful, and was perfect. Would definitely recommend! Excellent Seller! Super fast postage and lush guestbook. Got home from work today to find this little gem at home!! So happy with it!! Got my table numbers as well. Everything is such great quality and delivered with perfect customer service!!! Will recommend you to everyone!! Thank you for making my special day even more magically!! I was one of the lucky winners who got the chance to win one of these beautiful guestbooks! I received it today and they look even better in person! It’s beautiful! Thank you once again!! 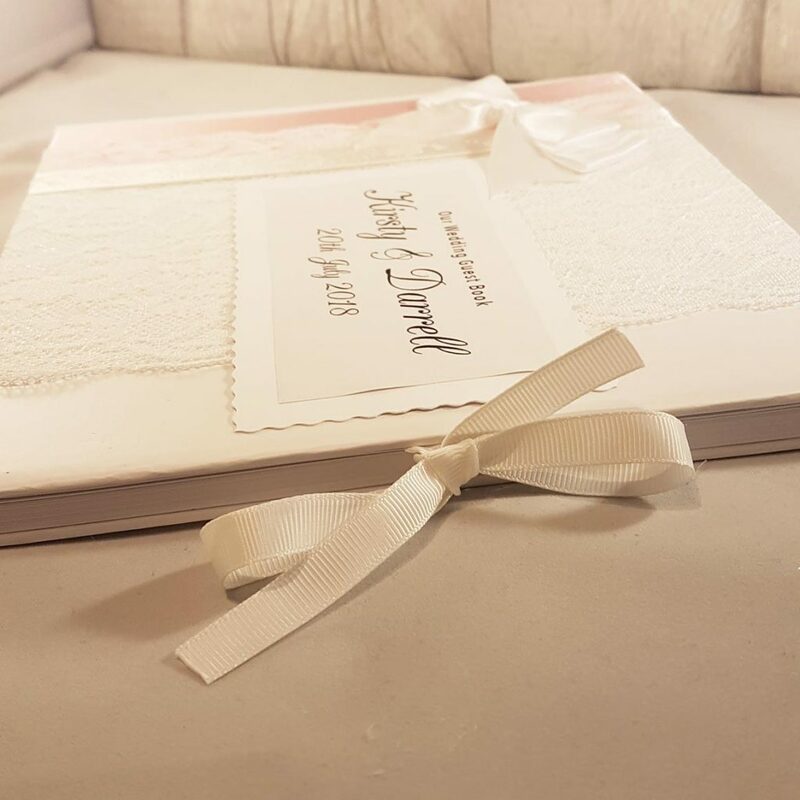 Our beautiful guestbook has arrived, in pristine condition and we absolutely love it – I will definately be recommending you to my engaged friends! Fantastic service, quick dispatch and guestbook is beautiful. Thanks again!! The book arrived and it’s absolutely beautiful, it’s better than I could of ever imagined! Thank you so much! We love it!